I've been having issues with my 1W blue gatling style laser for a while now and I'm not sure how to fix it. After I was not able to completely clean the old lens I purchased a brand new three layer lens for it. It is a bit difficult to see on the picture because of the bright dot but in reality those areas are much more noticeable. Does anyone know what could be causing this? Since I already replaced the lens this must be caused by something else. Gattling lasers are among the cheapest crap lasers you can get. I hope you didn't pay too much for it. The laser diode is a multi-mode diode if it is actually 1 watt. That means you will never get a good Gaussian beam out of it. If you are having new issues with it, it could be debris burn onto the diode's window. Often it can't be removed, but if you can see it on the window and take a cotton swab with 99% isoproply alcohol and carefully try to clean it off. If it won't come off, just stop and live with it until the diode dies. In the future, keep your laser wrapped up and out of the air when dust and dirt can settle on it. Did you try the lens both ways--are you sure it is installed correctly? Post a photo of the front of the laser where the lens is. 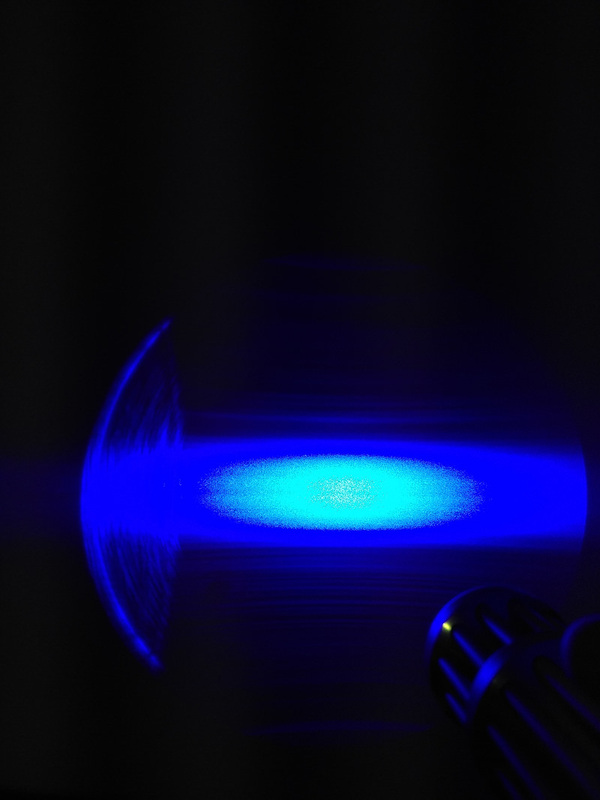 In case you didn't know --none of the multi mode 445nm blue lasers has a round (Gaussian) beam and dot output--they all produce a rectangular dot. PS Please do a Welcome post in the Welcome sub-forum telling something about yourself and put your location in your profile. You will get a better response form members. Chris, also, forum rules state that images should be 800 pixels wide. 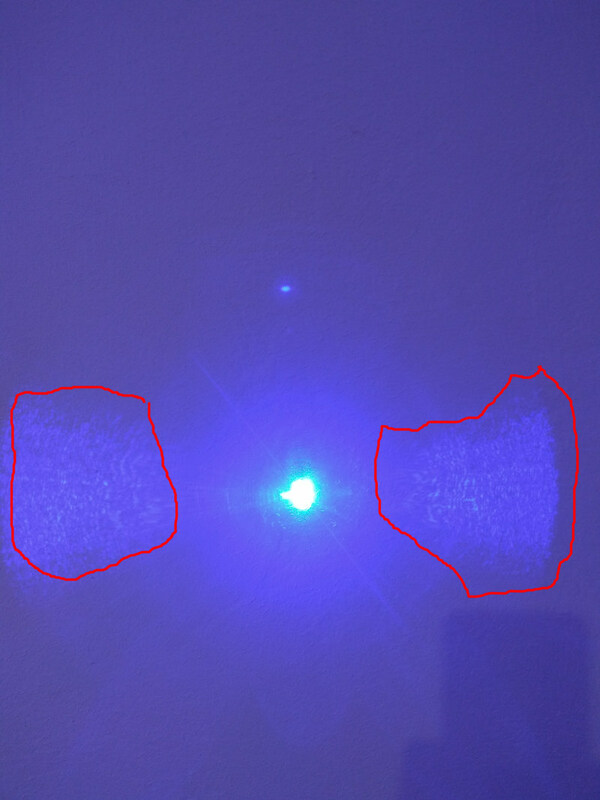 Please resize your image/s since the one you posted is over 4100 pixels wide..
Those artifacts to the sides of the spot that you circled are due to the lens. Not much you can do other than masking it someway, which won't be easy in the gatling host. Lens isn't defective, the beam is just too big and clips the side of the lens and makes this pattern. A G2 Lens fixes the side spatulation but then you get a rectangular Block next to the main spot. Reflection from the front of the diode mount. Not sure which is worse. 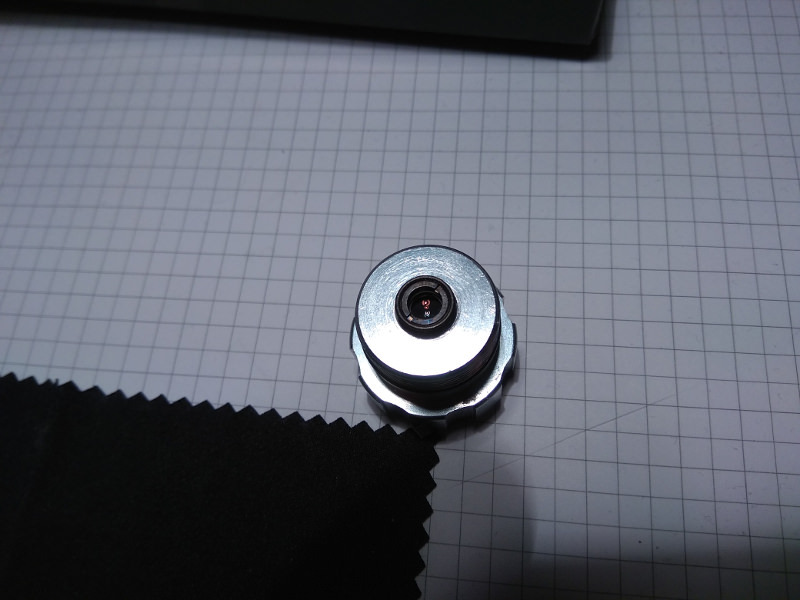 We need new lenses for modern diodes. 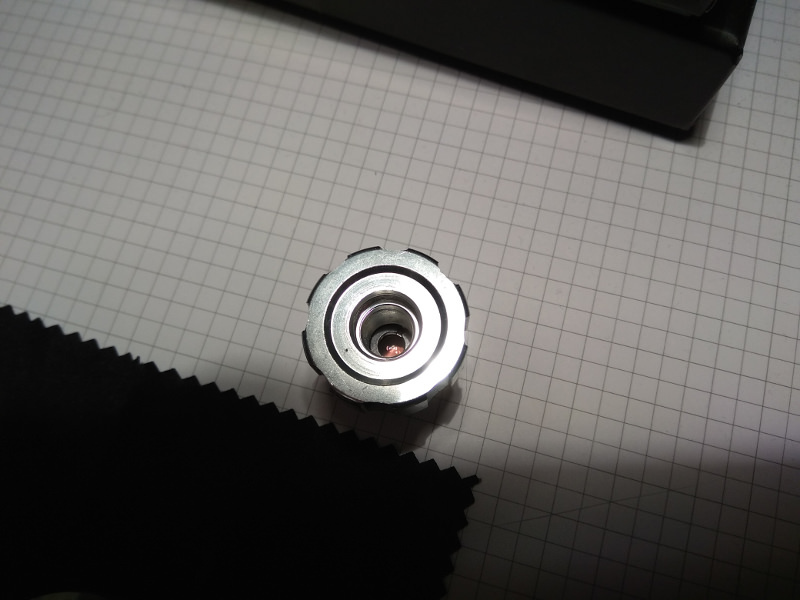 Do you know which diode this thing has in it? I don't. If it is a 405nm or 445nm, I wouldn't think the rectangular artifact would be an issue. Maybe if it is a MM 405nm. No I don't know which diode. But it seems all the Multimode diodes have the same issue. I know enough about the spatulation wings on the side. And when I have seen that with a diode using a G2 lens removes them but always leaves the Rectangular box. Of course this could be a different problem. But it looks very familiar. I just use 2 or 3 Ellement glass now days. The Bright rectangular box frm a G2 is worse than this problem. I agree with that. I hate the rectangular artifact more than any splash or other aberrations from different lenses. I just have not seen it with the M140, NDB7875 or any of the other MM 445nm diodes. Yes, I am pretty sure that I installed it correctly because I tested it both ways. However, I am not sure why that is or how to fix it (if it is even possible). I actually did buy a G2 lens before but it was defective so I was never really able to test if it is any better than a three layer lens. It certainly is a 445nm diode. I do also have a 405nm laser pointer and it is very easy to tell the difference. I'm intrigued by the idea of using silicone 'jelly' lenses. They would let us adjust the collimation of the fast and slow axis separately for, theoretically, as ideal a beam profile as possible with just a single lens. They can certainly handle several watts of optical power with no problem but you can't put an AR coating on them so losses would be much higher. Sigh, no free lunch. Though the 405nm and 445nm laser are easly to differentiate in person, from photos it is not so easy. Your 445nm looks more like a 405nm in your photo. That host is anything but a solid piece of aluminum. 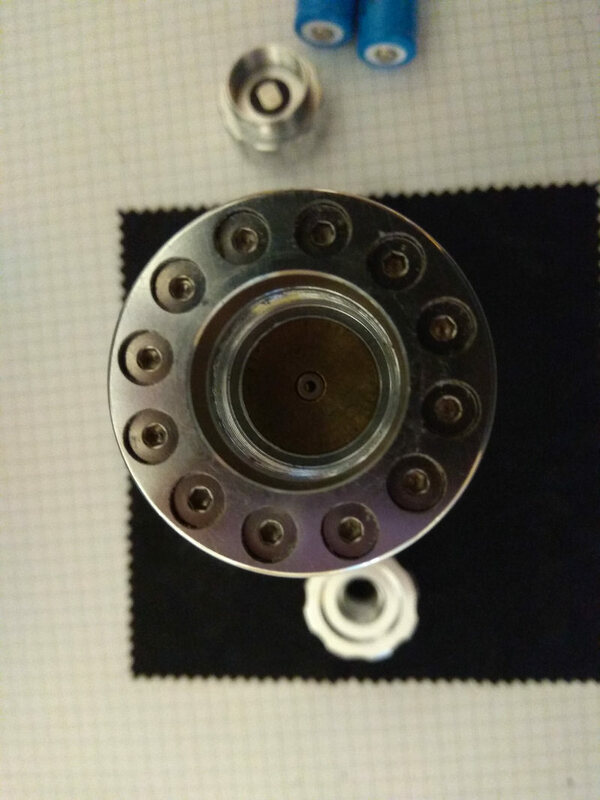 It is hollow tubes with a small brass disc in the center for a heat sink. Also, you don't need to multi-post to answer questions. Click on the "mulitquote" icon at the bottom right of each post you wish to quote and answer, but click on "quote" for the last one. Then you will have them all show up in one post and you can answer them all there. Also, the lens you bought is a three element lens. Not three layers. It has three separate lenses in it.